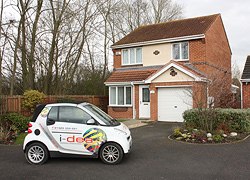 i-dea ltd are pleased to introduce a brand new range of packages to Estate Agents. Bronze, Silver and Gold packages cover a portfolio of services including: EPC, Detailed Property Reports and Floor Plans. i-dea can produce your floor plans for you as part of the Gold package. This will save you time in multiple trips to the property and can be combined with our other services in one easy to organise visit. For more information about our new Estate Agent packages please call us on 01325 352221.